This is just south on Hwy 75 south. A farmer does it with his tractor. Not sure if he uses a plow or a disc. He uses GPS to get the letters readable. He has done this every fall for several years now. 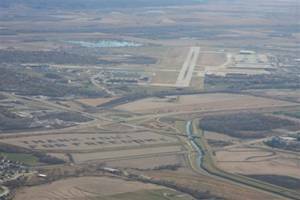 Here's the view from the flight pattern into OFFUTT AIR FORCE BASE (Bellevue, NE just south of Omaha). 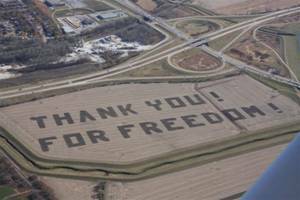 This is what our servicemen see when landing at Offutt AFB. Salute to the Bellevue farmer who made it happen! Nice. I was born at the hospital on that base, by the way. You should look at the satellite map shown on google maps. I think the message may be different since then. BTW, servicemen landing at that base? I'm laughing. It's mostly only colonels and generals who fly in/out in T39's (small corporate jets). They need to maintain hours to keep their pay up since most of them fly desks nowadays. Also some Looking Glass aircraft, but not like during the cold war. Don't ask me how I know all this.